A pair of Bigfork men are accused of stealing more than $300,000 worth of gold bars, coins, artwork and guns from a self-storage unit then using some of the proceeds from their heist to buy a race car, trailer and other items. Robert Earl Staudenmayer, 32, and Richard Gordon, 49, appeared at District Court in Polson on Wednesday, Nov. 14, on charges of theft and money laundering. 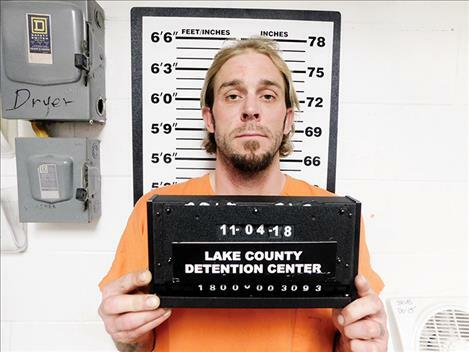 According to charging documents, the Lake County Sheriff’s Office received a report of a break-in at a self-storage unit in the Bigfork area on June 1. The victim said he had not checked his storage unit since fall of 2017, and now, he is missing $300,000 in gold bars, coins, artwork and guns. A safe was also taken from the storage unit. On June 21, Lake County Undersheriff Ben Woods received a call from a company called Leads Online about a stolen gun. Leads Online is a technology service that helps law enforcement reunite stolen items to their rightful owners, catch criminals and help businesses reduce the hassle of reporting. In this case, it was owners of a pawnshop in Kalispell that used Leads Online to identify a gun that was taken from the Bigfork area storage unit. Records at the pawnshop showed that a woman by the name of Kristen Kliev pawned the gun and that Kliev pawned another gun that she later repurchased from the pawnshop. On June 25, Woods learned that Staudenmayer had traded one of the stolen guns to a John Gabrielson for a Jeep. Gabrielson told Woods that Staudenmayer claimed to have more guns he wished to sell. Woods’ investigation would lead to the execution of a search warrant on Kliev’s property where some of the stolen artwork was recovered. Kliev would later claim that Gordon gave her the artwork to sell along with some guns. Another search warrant was obtained for a residence on Swan River Road where Gordon was staying. More stolen items were located there along with two vehicles that Woods would later learn were allegedly purchased with proceeds from the sale of some of the stolen items. When asked about the artwork, Gordon claimed he found them at the dump. Gordon admitted that he sold gold to a coin collector in Kalispell for $1,907.07. He said he inherited the gold from a brother who recently passed away. Staudenmayer said that Gordon told him the gold was dug up using a treasure map. Staudenmayer admitted that he and Gordon bought a trailer in Chehalis, Washington and bought a racecar in Seattle with proceeds from the sale of the gold. Staudenmayer is also facing a charge of robbery for using violence against a woman on Sept. 4 to obtain control over her debit card. The woman told investigators that Staudenmayer knew the card’s pin number and two unauthorized transactions were made on the card later that same day. Staudenmayer entered a not guilty plea to the charges. Lake County Deputy Attorney Ben Anciaux told the court that in 2005 Staudenmayer was committed to the Montana State Department of Corrections on burglary and tampering with evidence charges. District Judge James Manley maintained bail at $100,000 for Staudenmayer and set his case for trial on April 15. Gordon’s arraignment hearing was continued to Nov. 21. He remains in the Lake County jail with bond set at $50,000. Anciaux told the court other people could be facing charges as the investigation continues.